Players in Asia’s polymer markets report that sellers are attempting to arrest the decreasing trend which has been in place for most of the second half of the year, citing a relatively slower pace of decline in feedstock markets as well as reports of improving buying interest after a prolonged period of subdued demand. However, some players remain skeptical regarding the likelihood of a stabilization in prices and are predicting that the markets will resume their downward trend once buyers return to their desks following the holidays, according to ChemOrbis. 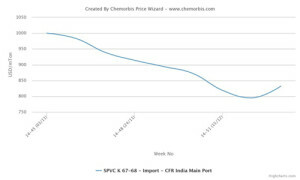 In the key Indian PVC market, prices regained some lost ground in the last few days before the holidays on the back of improved demand from traders. A Taiwanese major reported lifting their prices to India by $30-40/ton. “We concluded a good number of deals in the past month and we managed to clear out some of our excess stocks. We hear that American producers insisted on relatively high export prices while acetylene based PVC cargoes are no longer competitive relative to conventional materials and these factors allowed us to enhance our competitiveness in the market. We think that prices will remain firm into the coming month as stock levels are low in India,” a source from a Taiwanese producer reported. A trader based in India added, “Traders are replenishing their stocks as demand from India’s construction sector normally does well from January to April while local inventories are limited after an extended period of muted demand. We think that a local producer will announce an INR3000/ton ($47/ton) hike later this week, although we are skeptical as to whether or not these increases can remain in place over the medium term.” According to data from ChemOrbis Price Index, import PVC prices on a CFR India basis pared some of their losses in the past week after recording a cumulative decline of $205/ton compared with the beginning of November. Sellers in the region’s PP and PS markets are also taking a firmer stance on their prices heading into the new year after spot prices for propylene and styrene pared early month losses in the second half of December. 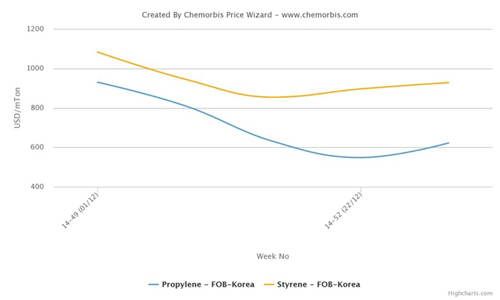 According to data from ChemOrbis Price Wizard, spot propylene prices on an FOB South Korea basis fell around $380/ton from the start of December to the middle of the month before regaining some lost ground to finish the month with a reduction of around $310/ton. 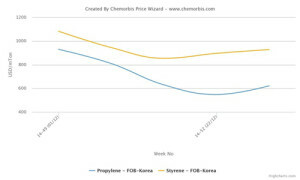 In the styrene market, spot prices on an FOB South Korea basis dropped approximately $230/ton in the first half of December before paring some losses to end the month with a decline of around $155/ton. In the PS market, a Vietnamese converter manufacturing disposable items reported receiving significant week over week increases on HIPS prices from different Taiwanese suppliers. “Our suppliers lifted their prices after spot styrene prices regained some lost ground. We tried to place a bid at levels close to the upper end of last week’s range, but our supplier refused. However, we are planning to delay our purchases as we feel that the recent increases may prove fleeting given the recent losses in crude oil prices,” the converter commented. A Southeast Asian producer, meanwhile, said that they maintained their prices to the regional markets given stronger spot styrene costs. “We believe that market trend is beginning to stabilize, although we are still willing to consider some discounts for buyers placing firm bids,” a producer source stated. According to ChemOrbis, energy costs present perhaps the biggest obstacle to sellers’ hopes of stabilizing the markets after the holidays as prices for naphtha and crude oil ended the month on a weaker note after holding steady for much of the second half of the month. As of the time of press, crude oil prices were trading at their lowest levels of 2014, with NYMEX crude being quoted slightly below $53/barrel while Brent crude stood at around $56/barrel. Oil prices continued to slip on the last day of the year in spite of fresh supply disruptions resulting from the ongoing political turmoil in Libya. At the start of December, NYMEX crude had traded at $66/barrel while Brent crude stood at $70/barrel. Tracking the weakness in oil prices, spot naphtha prices on a CFR Japan basis ended the year at levels close to the $450/ton threshold, a drop of around $150/ton from the start of the month and the lowest level recorded for 2014.